Drafts is a sweet app for writers and anyone else who wants to quickly create notes and then get on with life. Launching the app quickly brings up a blank screen ready for your text input. Jot a note and exit. Drafts will automatically save your text without you having to worry about it. Another great feature is that Drafts can be set to open your text in other apps or web pages. For instance, type in a note and send it to your email, iMessage, Facebook, Twitter, or Evernote. Create events with your notes in Fantastical or Calendars. Search Google Maps, Amazon, Wikipedia. With these features the possibilities are endless. Think of Drafts as everything from a quick notepad to an app launcher. Check out all that Drafts is capable of in its Action Directory. Drafts also presents a few neat buttons to the Today screen that will get you right into fast note taking mode. Hit the + button to start a blank note, the + clipboard button to generate a new note from your last copied text, or the open button to launch the app into your notes list. This is a great update for those looking to jot down ideas without even having to find and open an app first. The new Apple Watch version of the app lets you dictate notes using your voice. 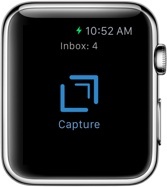 It also gives you a quick view of your inbox. This video by the developer shows how it works. Drafts is just one of our favorite automation apps for iPhone and iPad. We’ve collected all of our favorites here. And if you’d like to see more of our top app selections in different categories, just head on over to our Best Apps Series.